Blue Tourmaline evokes the tranquility of deep blue water and gliding well beneath its surface. It invites surrender of all thought to the solitude of a liquid silence, a graceful world of letting go... then rising to the light. It is also known as Indicolite, a variation of the original Indigolite, and refers to its deep blue color. Rarer than other Tourmalines, it forms in shades of light to dark blue, some with a tint of turquoise. In the metaphysical world, Blue Tourmaline is a crystal of Spirit and peace, providing for deep meditation and bringing past hurts to the surface for healing. It encourages the release of emotional bonds and frees the mind to explore a higher consciousness and spiritual connection. The Throat Chakra is the voice of the body. It is, in essence, a pressure valve that allows the energy from the other chakras to be expressed. If it is blocked, or out of balance, it can affect the health of the other chakras. When the Throat Chakra is in balance and open, it allows for the expression of what we think and what we feel. We can communicate our ideas, beliefs, and emotions, bringing our personal truth out into the world. We have an easy flow of energy within the body and spirit. The energy that springs upward from the lower chakras can continue its path enabling free expression and natural release. Blue crystals are used to balance the Throat Chakra. The Brow Chakra, also called the Third Eye, is the center of our perception and command. It directs our sight and everyday awareness of the world. Our consciousness is located here, and we relate to ourselves through this chakra. When the Brow Chakra is in balance our thoughts and internal communications within ourselves are healthy and vibrant. We are open to new ideas, dreams, and visions, and can control the flow of energy within all the chakras. Dark blue or indigo crystals are used to treat imbalances of the Brow Chakra. Blue Tourmaline reflects the color energy of a clear, radiant sky as winter gives way to spring and the sun climbs higher each day. It marks the beginning of life and emotion. Blue crystals bring trust, faith, patience, and respect, lending the focus we need to become more sincere, act more responsibly, and become more trustworthy. Light blue crystals help us accept the life we have, develop patience, reconcile differences, or seek forgiveness. They also assist in dealing with grief, letting go of the past, and curing guilt. Dark blue crystals enhance the respect and compassion we have within ourselves. They teach us humanity, discretion, and honor, and encourage us to act more charitably and focus our efforts on service to others. Blue Tourmaline varies in color from pale to deep blue. If your birthday falls in any of the following periods, a Blue Tourmaline of the color listed can be a valuable conduit to your Guardian Angel. The table also provides the name of the Guardian Angel of those born in the time period. Blue Tourmaline honors Al-Uzza, the Nabataean Moon Goddess of Full Moon and Mothers. She is also the Most Mighty Goddess, and maiden warrior form in the triple goddess with Allat and Manat. She is a fertility goddess and protector, and the ruler of wild beasts. Blue Tourmaline might also be used to honor Whope, the Lakota Sioux Goddess of Peace. She is not only the goddess of harmony, but also of meditation and friendship. Tourmaline is not a traditional birthstone. Tourmaline which is blue in color is one of the natural birthstones of those born as the world awaits the vernal equinox and spring (February 19 - March 19). This is a time when new life is about to burst forth, a time of faith and trust. Blue crystals bring you patience and respect. Tourmaline is a Seeker Energizer talisman. Seekers contain the crystal energy structure that aligns the natural energy of the crystal to the natural power of the human mind to find the way to new horizons and new capabilities. They’re pointers, directors, and compasses; the fresh start crystals. These are talismans of the scientist, the adventurer, the hunter, wanderer, and explorer. They’re also crystals of the student and the researcher. 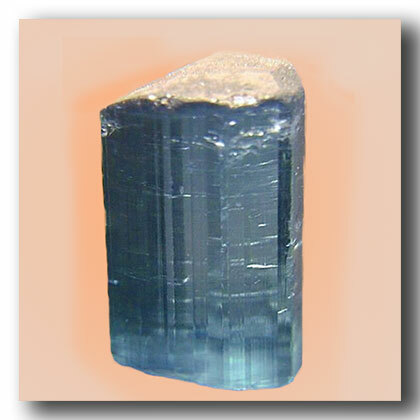 Blue Tourmaline utilizes Water energy, the energy of stillness, quiet strength, and purification. It embodies potentialities unrealized. It is yielding, formless, yet powerful. The Water element brings power of regeneration and rebirth. It is the energy of the circle of life. Use turquoise crystals to enhance any space that you use for repose, calm reflection, or prayer. Water energy is traditionally associated with the North area of a home or room. It is associated with the Career and Life Path area, its flowing energy assuring a balance of energy as your life unfolds and flows.